Pinched nerves interfere with the brain’s ability to communicate with all the parts of the body. This interference is known as subluxation. In the simplest of explanations, the job of Chiropractic is to take the hard bone off the soft nerve. No medication in the world can do that! You are never too young, or too old to be helped by Chiropractic. Dr. Stuckey has checked and adjusted countless newborns, all the way to people in their late 90’s. Chiropractic is not just limited to backs and back pain either, as the nervous system controls every cell, tissue, organ, system, and function in our bodies. No matter what you’re suffering from, chiropractic care probably offers a safe, natural solution. Chiropractic care is also a wonderful way to keep your healthy body functioning at its fullest potential. Even if you don’t feel sick or in pain now, remember that it is easier to stay healthy than to get healthy. We use a number of highly-effective adjusting approaches to help improve spinal biomechanics and reduce nervous system interference. The approach we use is based on our clinical judgment and years of experience. 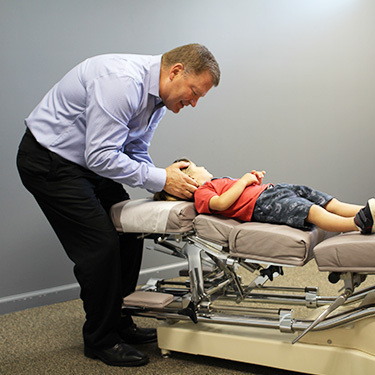 The primary adjusting technique Dr. Stuckey uses is Diversified. If you’ve been to a chiropractor before and prefer to be adjusted in a particular way, let us know. We want you to relax, enjoy and fully benefit from your chiropractic care. If you are unsure or even a little fearful of Chiropractic and receiving care – come visit us! We invite you to come hang out with us for a little while. Talk to the other people coming and going in the office. Ask them about their care and experience here. Watch the people and notice the loving healing that happens here. See their smiles and learn why they are happy!